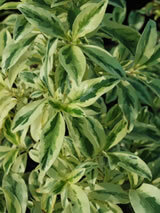 A beautiful shrub with long semi-pendulous layered branches. 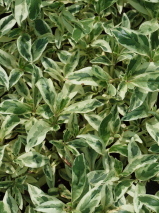 Long narrow green leaves edged in white are most attractive. Although it is a male clone it occasionally produces bright orange berries. Grows in most soils though avoid really dry conditions. Shelter from frost and best in partial shade.